As you have already understood, your goal is to park this amazing golf cart! Cool, yeah?! There are a lot of impediments, so be very attentive. Be in a hurry and park it as quick as possible. The right place is marked by the letter "P". is everything clear? Ready? Go! Park your cart as better as possible! 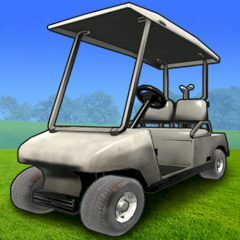 You are in the golf yard, where your main goal is to drive your cool vehicle. There are a lot of obstacles, like sand and water. Are you ready for such an exciting challenge? Then do not waste time and park it! This is the limited plying time, so hurry up and become the winner. Who knows, maybe you will be the first one, who can set the record. As you know each golf cart should be parked in the right place. Do not stop and try to be in time. Have faith in yourself and do not make a crash.